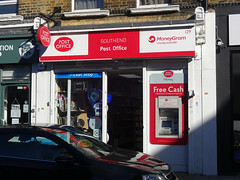 Post office on South End in South Croydon. It has one external cashpoint. See photograph of frontage in August 2012. Existence last checked in February 2018. Last edited 2019-03-27 10:56:53 (version 31; diff). List all versions. Page last edited 2019-03-27 10:56:53 (version 31).